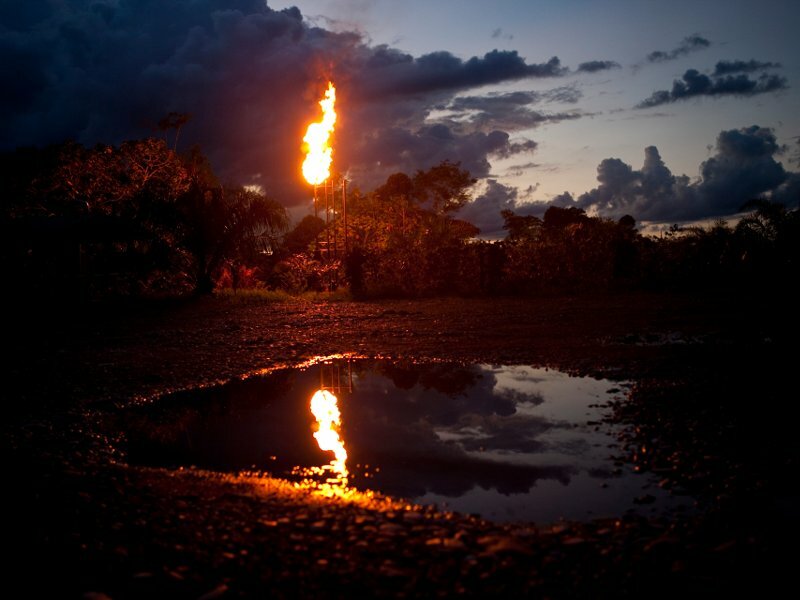 Over three decades of oil drilling in the Ecuadorian Amazon, Chevron dumped more than 16 billion gallons of toxic wastewater into the rainforest, leaving local people suffering a wave of cancers, miscarriages, and birth defects. For over three decades, Chevron chose profit over people. While drilling in the Ecuadorian Amazon from 1964 to 1990, Texaco – which merged with Chevron in 2001 – deliberately dumped more than 16 billion gallons of toxic wastewater, spilled roughly 17 million gallons of crude oil, and left hazardous waste in hundreds of open pits dug out of the forest floor. To save money – about $3 per barrel – the company chose to use environmental practices that were obsolete, did not meet industry standards, and were illegal in Ecuador and the United States. The result was, and continues to be, one of the worst environmental disasters on the planet. 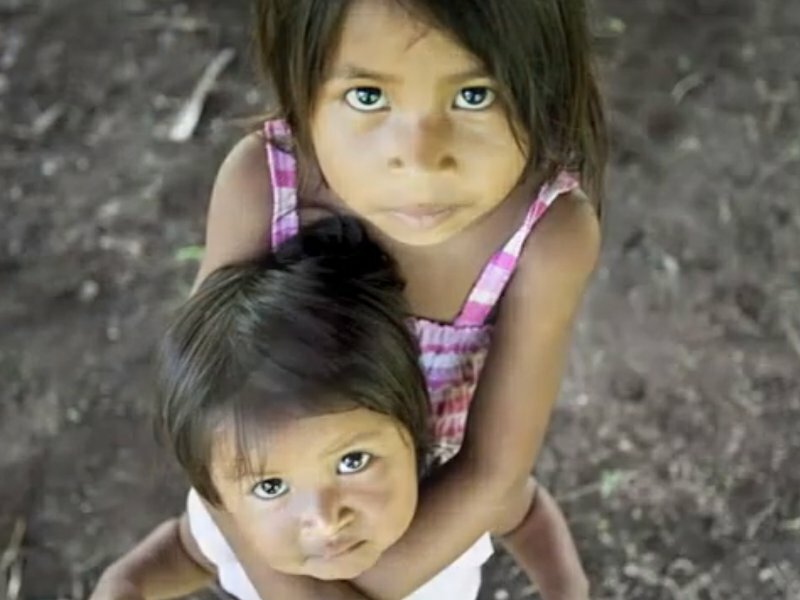 Contamination of soil, groundwater, and surface streams has caused local indigenous and campesino people to suffer a wave of mouth, stomach, and uterine cancer as well as birth defects and spontaneous miscarriages. Chevron has never cleaned up the mess it inherited, and its oil wastes continue to poison the rainforest ecosystem. 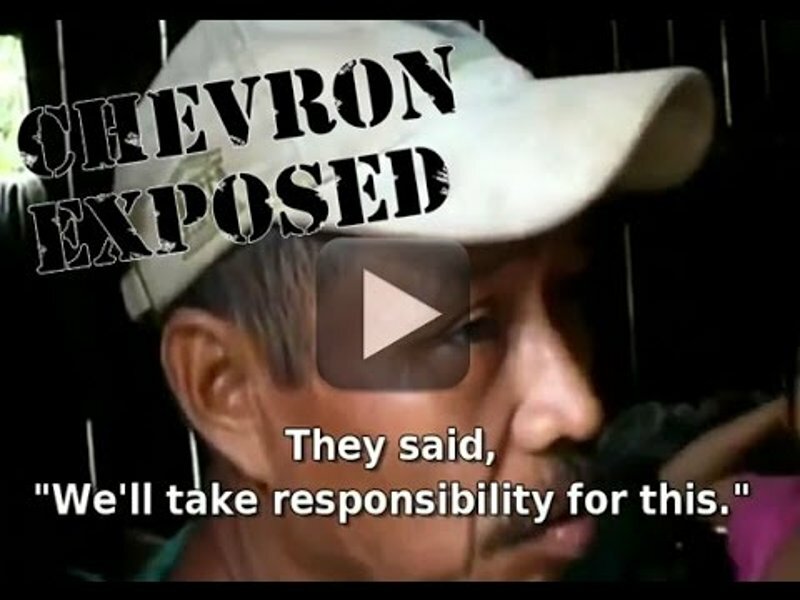 Today, Chevron is a corporate criminal on the run. 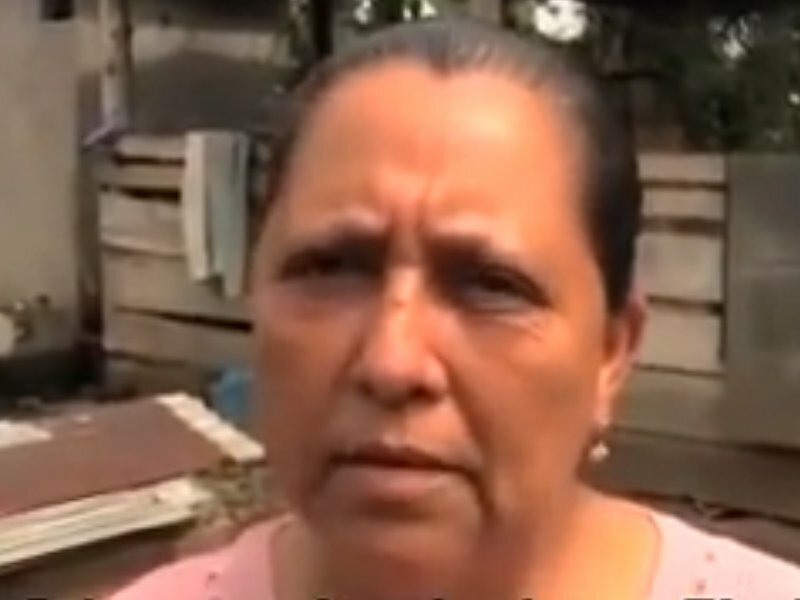 It has been found liable by Ecuadorian courts and ordered to pay $9.5 billion. 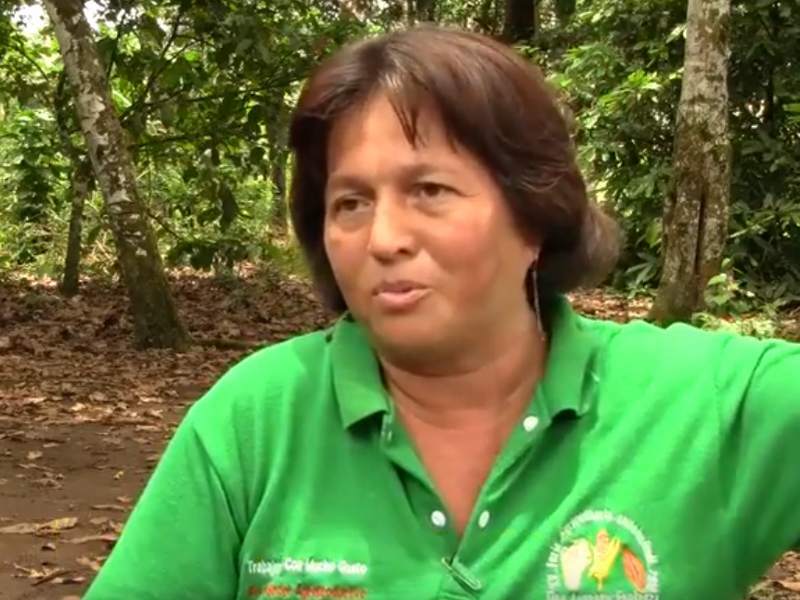 The company is now running from an international legal dragnet to force the company to pay for the vast task of cleanup and remediation of the Ecuadorian Amazon. The Ecuadorians have filed a lawsuit in Canada to seek seizure of Chevron's assets for this purpose. There are many thousands of documents, articles, studies, and testimonies demonstrating Chevron's guilt and the consequences of its actions. Below are just a few multimedia presentations that convey summaries or important elements of this tragedy. From the book by photographers Lou Dematteis and Kayana Szymczak. The Ecuador disaster is still considered the world's largest oil-related catastrophe, though it often is not "ranked" because it was the product of deliberate planning to cut costs rather than a spectacular accident, like the Exxon Valdez spill or the BP Deepwater Horizon explosion. Instead of taking responsibility and trying to remediate their disaster, Chevron has launched a blitz of public relations and massive retaliatory legal actions. 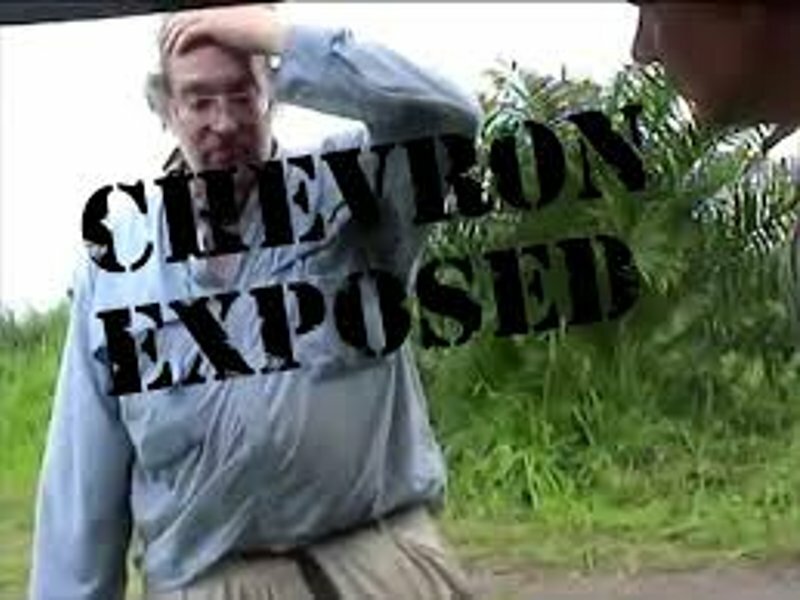 The truth is Chevron's actions cause death, cancer, birth defects, miscarriages, and reckless destruction of the Amazon. 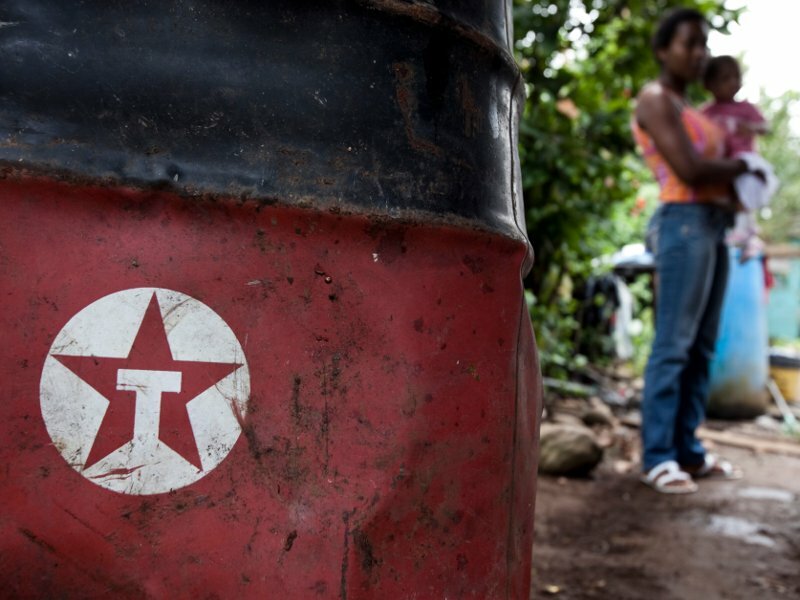 The plaintiffs in the case against Chevron represent a diverse group of over 30,000 indigenous people and campesino farmers living in and around the area affected by Texaco's past oil operations. Groups outside Ecuador, including Amazon Watch, cooperate with the affected Ecuadorians to tell their stories and to speak for themselves in front of Chevron executives, shareholders, and the concerned public. The existence of this advocacy network, organized by the affected people themselves to keep their communities connected to developments in the trial, is an important accomplishment. 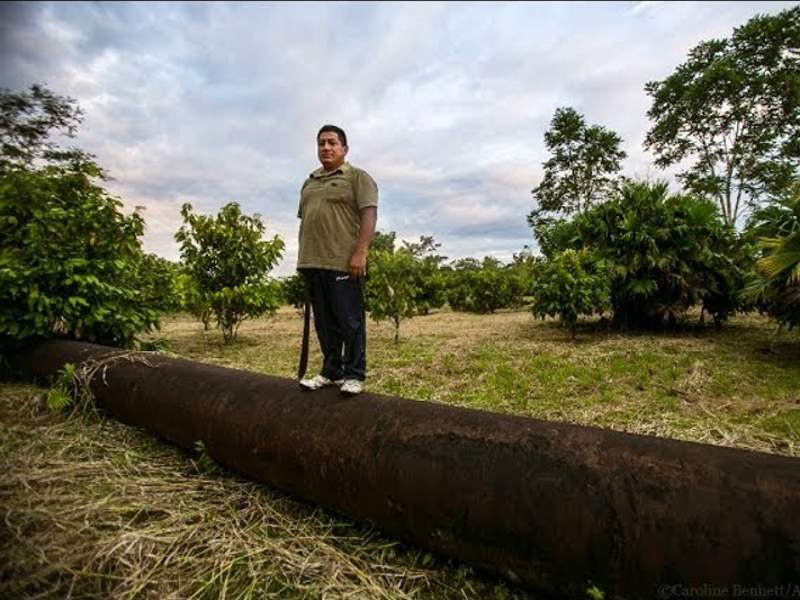 For years local people in the Oriente region of Ecuador suffered the effects of oil contamination and the social upheaval brought by fossil fuel operations without any recourse. The communities founded around the oil operations, including the regional capital of Lago Agrio and smaller towns such as Shushufindi, exhibited the endemic violence and social ills characteristic of extractive industry boom towns. In this harsh environment, determined locals organized around issues of labor protection and human rights in spite of the fact that the notion of holding a multinational corporation legally accountable seemed remote and unachievable. Many figures active in the case against Chevron were working on human rights in the region as early as 1990. Over the past 25 years, new generations of activists have joined together with their parents and grandparents to make sure that their children can live in a healthy environment. 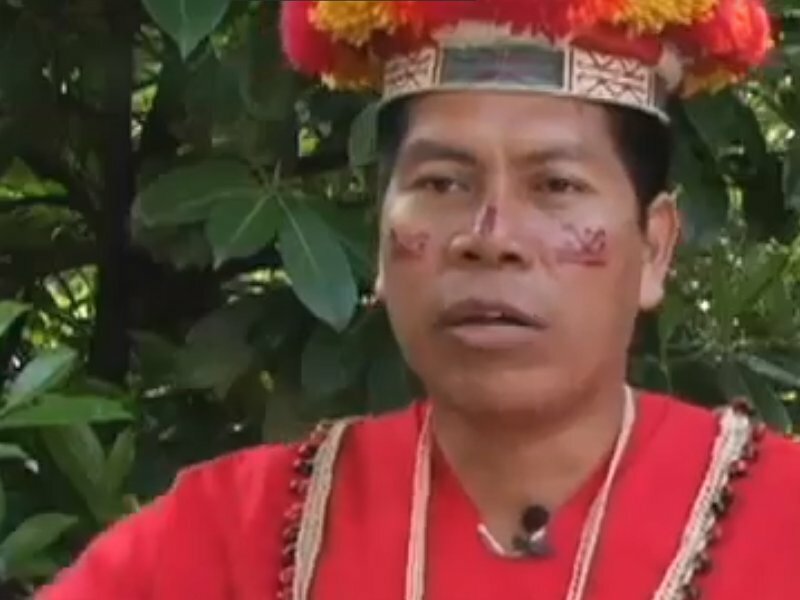 Chevron has been in court since 1993 over its contamination in Ecuador. In that year, the class-action suit Aguinda v. Texaco was filed in New York, where Texaco was headquartered at the time. The company petitioned for years to have the case relocated to Ecuador, submitting numerous affidavits praising the integrity of Ecuador's judicial system. In 2002, after a series of appeals, the company's request was granted and Chevron agreed to submit to the jurisdiction of the Ecuadorian court. The affected communities refiled their lawsuit in Ecuador in May of 2003, and Chevron immediately began to argue that it should not have to defend itself there either. One of the specious arguments that Chevron used to try to avoid trial was to insist that the government of Ecuador had released it from any further responsibility after it agreed to remediate a small portion of its contaminated sites in 1993. This "release" was negotiated with the government while the Aguinda case was already proceeding, and it explicitly excluded such private claims against the company. For this reason, Chevron's argument has been summarily dismissed whenever they have made it in court, although they still trot it out in press releases. Additionally, the clean up on which the release was conditioned appears to have been a fraud, as samples taken during the trial revealed that the "remediated" sites are just as contaminated as ones that were never treated. Over the next few years, numerous judicial inspections of Texaco's former oil installations and waste pits were carried out to determine levels of contamination and their sources. The scientific record resulting from these inspections clearly shows soil and water contamination by Texaco far above legal limits, and Texaco had already admitted to dumping toxic waste in the area for decades. Even Chevron's own scientists – as well as independent" labs that the company allegedly set up and controlled – obtained significant data that supports the case against the company. This despite its constant attempts to rig the results of the inspections, including by selecting samples from locations that they had secretly visited beforehand in a fruitless attempt to find uncontaminated areas, as was revealed when a whistleblower within Chevron anonymously mailed a package of internal company videos to Amazon Watch. In February of 2011, Chevron was found guilty and ordered to pay $9 billion to remediate the environmental damage and pay for clean water and healthcare facilities for the affected population, as well as an additional $9 billion in punitive damages. 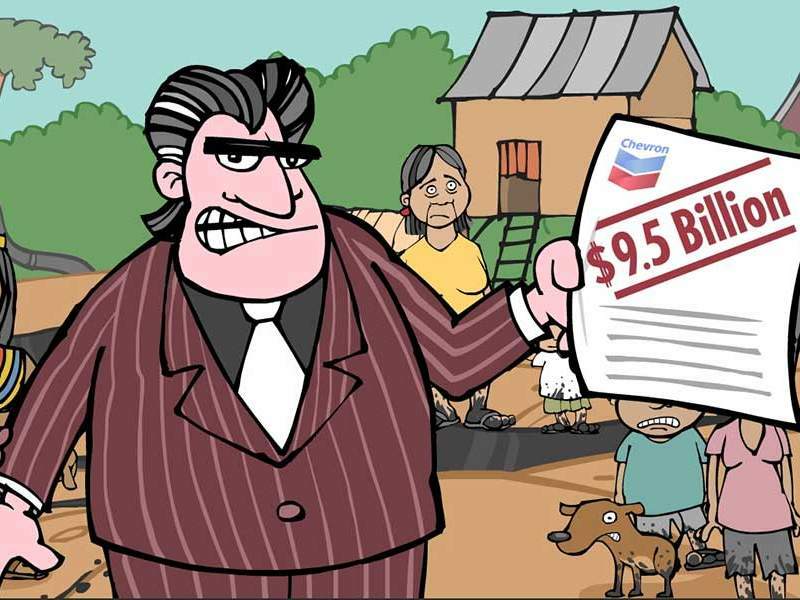 Chevron appealed all the way to the Ecuadorian supreme court, which issued its decison in November of 2013. In its 222-page opinion, the supreme court affirmed earlier decisions by a Lago Agrio court and the appellate court for $9 billion but rejected the additional $9 billion in punitive damages, given that this was not explicitly permitted in Ecuadorian law. It also lamented the plaintiffs waiting twenty years for justice and attributed this largely to delaying tactics by Chevron. Chevron Promises to Fight "Until Hell Freezes Over"
Rather than accept the final decision in the forum that Chevron itself insisted was proper and at long last cleaning up its toxic mess, the company instead vowed never to pay for a clean up and promised the communities a "lifetime of litigation" and to fight the judgment "until Hell freezes over, and then fight it out on the ice." Chevron filed a lawsuit in the Second District Court of New York under the RICO (Racketeering Influence and Corrupt Organizations) Act which breathlessly accused nearly every named Ecuadorian plaintiff, lawyer, scientific consultant, and allied activist organization involved in the Ecuadorian case – including Amazon Watch – of perpetrating an enormous fraud in order to extort the oil company. 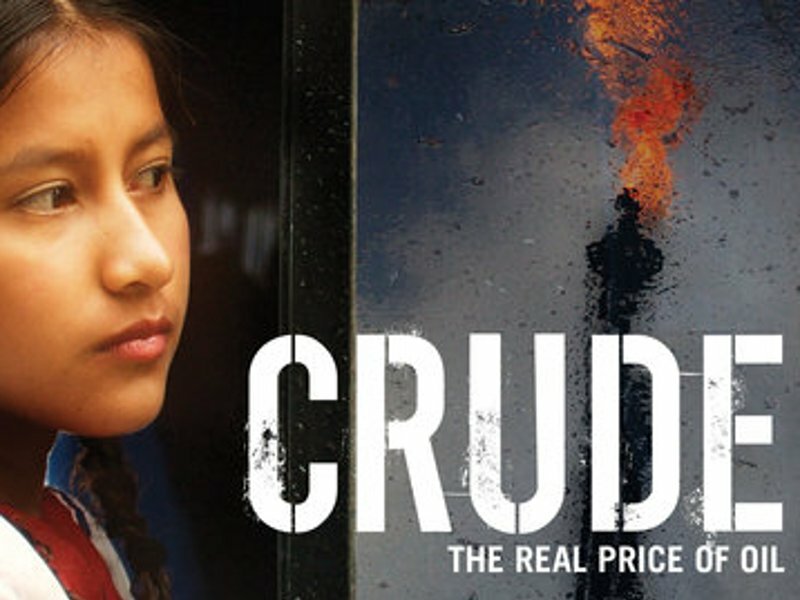 Chevron's "evidence" came largely from hundreds of hours of outtakes from the documentary CRUDE, which show plaintiffs' lawyers making candid and tongue-in-cheek comments that – taken completely out of context – suggest an effort to manipulate the court and continue its campaign to demonize" its adversaries. 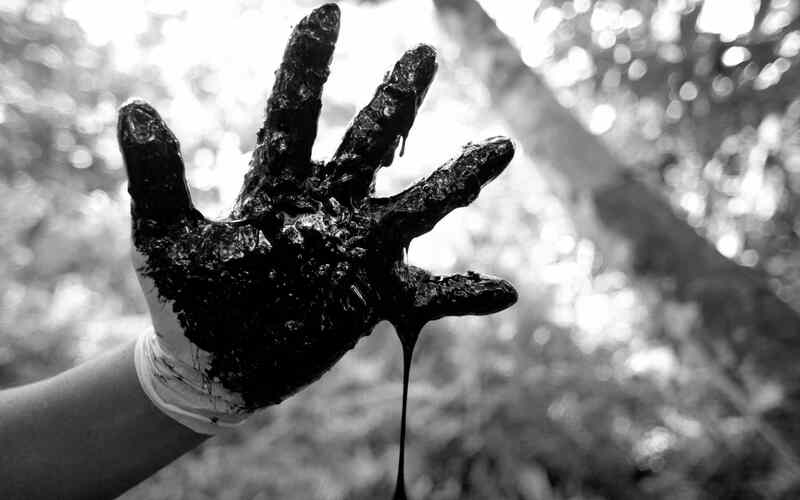 In light of the abundance of scientific evidence proving Chevron's liability for contamination, these allegations were clearly yet another attempt to avoid justice and shift the focus away from the suffering of the affected Ecuadorian people. Chevron's forum shopping found them a grossly biased judge and venue for the New York RICO trial, which completely excluded all evidence of the actual crime in Ecuador and was tried as a civil case without a jury. Additionally, the case that Chevron's army of attorneys did present has since been disproven by forensic evidence and a shocking under-oath admission of perjury by its key witness, who was prepped by Chevron's legal team for 50 days and paid at least $2 million for his testimony. Essentially, Chevron used bribery, false testimony, and fabricated evidence to win a judgement from a biased judge in a US court so that it could wield that decision as a shield in other jurisdictions. And yet, even that was not the end of Chevron's scorched-earth strategy. It has attempted to use this lone RICO decision to attack attorneys and supporters of the Ecuadorian plaintiffs and force them to defend themselves against spurious charges in multiple jurisdictions. As is typical of a SLAPP suit, the end goal is not necessarily to win these cases but to bankrupt and exhaust those who attempt to hold them accountable. And ultimately, their intention is to intimidate everyone who might be a thorn in their side for fear of being mercilessly crushed. In fact, other corporations have begun to use the Chevron playbook to suppress and vilify environmental and other activists to avoid responsibility for their own bad behavior. This is the Clean Up Ecuador campaign website of Amazon Watch. If you are looking for the previous version of this site (used between 2000 and early 2018), you can view its archive at chevroninecuador.org.